Marshall Field created a self-sufficient English-style estate manor as a combination country club, hunting preserve, and home, complete with its own water and electrical supply. When the estate was finished, it had facilities for every sport except golf. During its peak, more than one two hundred people were employed at Caumsett, tending the extensive gardens, polo ponies, cattle herd, and, of course, the family and their numerous guests. 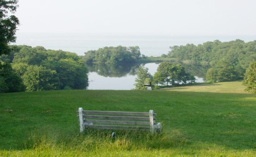 Acquired by New York State in 1961, Caumsett State Historic Park’s extensive forests, meadows, and waterways provide habitats for a variety of flora and fauna. The diversity of the park’s environment, and its limited access to vehicles, make it one of Long Island’s best places for relaxation and enjoyment of nature. This computer based guide will take you on a four mile journey through Caumsett’s woodlands, open meadows, freshwater pond, and, ultimately, to Long Island Sound. You will look into the past, and read how some of America’s richest wealthiest people lived and played on what was once called ‘The Gold Coast’. 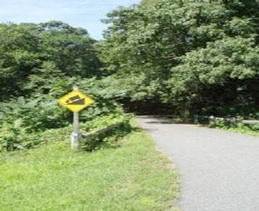 Should you decide to make the trip in person, you should know that the roads are mainly flat, though the road to Long Island Sound is steep, and can be difficult. 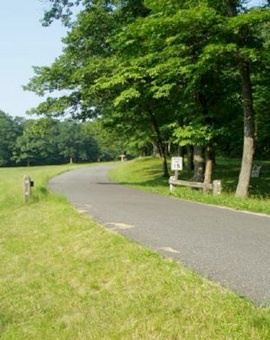 There are, however, a number of benches along the road for taking a rest. At a normal walking pace with occasional stops, the full walk will take about two hours. 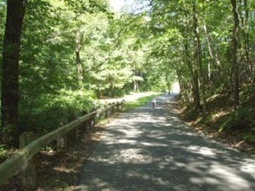 During warm, sunny weather, portions of the walk may become extremely hot. Please drink liberal amounts of water and stop to rest when necessary. A drinking fountain and restroom is available at the Park office (behind the barn) and at the Main House. This portion of our website is not an identification guide to every plant and animal found in the Park, nor is it an overly detailed historic piece; there is not enough space to cover everything! Instead, it is intended to highlight some of the interesting natural and historic features of the Park. If you find that you have more questions than you started with, please stop at the information kiosks or the Park office. Finally, as much as we hope this guide will enhance your Park experience, remember that the Park is a beautiful and wondrous place at any time of year. Be sure and schedule a visit as soon as possible! Spend most of your time in the park looking, hearing, and just enjoying your surroundings. 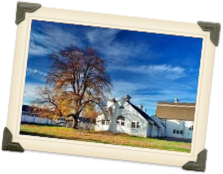 You are sure to discover more about Caumsett State Historic Park by visiting in person, walking slowly and keeping your eyes and ears open then moving your mouse around a computer screen! Our journey begins at the visitor’s kiosk located at the edge of the parking lot. Make sure you spend a few moments at the kiosk’s exhibits before continuing on. Take along the free park map you received at the collection booth as you entered the park. 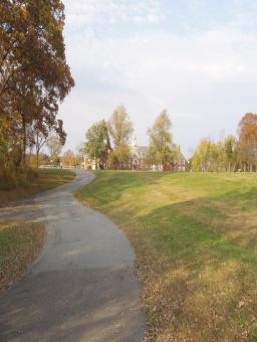 Next, walk to the cobblestone path behind the kiosk and make a left turn to the farm group buildings. The buildings here were designed by Alfred Hopkins, Architect. Not quite a yellow brick road...begin your tour by walking down this path to the farm group complex. 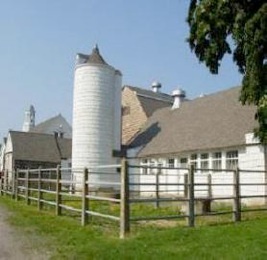 Completed in 1923, the Caumsett Farms Dairy was home to Marshall Field III’s prizewinning herd of Guernsey cattle. The Caumsett herd, consisting of up to 100 cows and bulls, was renowned for their production of milk and butterfat, and set several records. A stone marker behind the barn commemorates six of Caumsett Farm's prize winning cows (Photo left). On August 20th, 1953 the Long Islander newspaper reported that a registered Guernsey cow named Caumsett Regal Gloss had set a United States record for product production. On a three-times-daily schedule, the cow produced 14,078 pounds of milk and 647 pounds of butterfat in a one year period! Each of the estate's residential staff (~ 85 people) received a several quarts or more of fresh milk from the farm - daily! The remainder was sold in Huntington village. The herd was sold in 1957, about one year after Marshall Field III’s death, to Mr. Henry C. Vernier of High Meadow Farms. 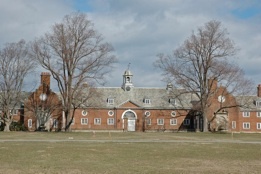 The Dairy complex, now undergoing restoration by the Caumsett Foundation, is currently used by the Park administration for offices, workshops, and storage. 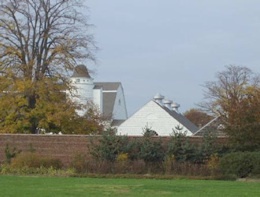 The dairy complex is part of a larger farm group that included the bullpens, which are still located behind the barns; stables, and chicken coops. 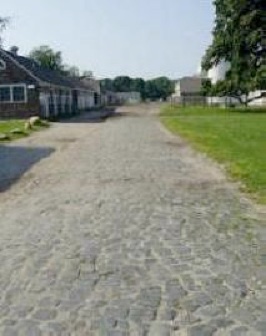 Next, walk up the cobblestone road through the farm group; turn right on to the dirt road as shown above right. Public restrooms are on your right. Follow the dirt road, and make your first left turn. 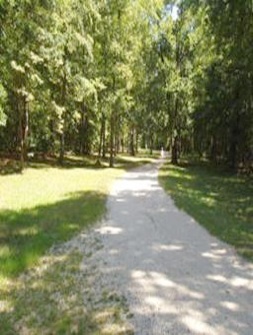 Stay on the dirt road about a quarter mile to the main drive by the equestrian center. You will be making a left onto the main drive. While you walk the dirt road, you will notice a natural fence line to your left. This is called a "living fence". If left alone, land environments on Long Island eventually grow into forests. This fence line has been uncut for nearly 15 years and has grown into a dense thicket of vines and small trees. The common tree in the fencerow is Sassafras (Sassafras albidum), which has unusually shaped leaves. Poison ivy (Toxicodendron radicans) also does very well in this type of environment, and grows heavily along the fence. Farmers would often encourage the growth of these ‘living fences’ - they are good windbreaks, and provide shade for livestock. Wild fencerows are also excellent havens for wildlife, including chipmunks, squirrels, and rabbits, and many species of birds, who take shelter under in the thickets and feed on the many berries and seeds found here. Again, make a left turn off the dirt road and onto the main drive. You are now on a paved road heading North. Welcome to the main drive. This was the main vehicle entrance to the Caumsett Main House you will see in a few minutes. If you turn around, you will see the road continue straight to a tee. Cars entered from the right and made a left at the intersection. Service and maintenance trucks would continue straight through the intersection taking the service drive to the Main House. Many a visitor were amazed at the size and beauty of the building to your right. They would exclaim how beautiful the Main House was...and then be politely informed that these were "only" the horse stables!! Continue your walk on the paved road. Note how the road is never quite straight and is lined with trees. The main drive was more than just a way to get to the mansion Main House - it was an important part of the Caumsett experience. The transition from open, sunny fields to shady woodlands is sudden; the way the road curves and dips into the dark forest is a deliberate landscaping technique, used to create an air of mystery and a sense of anticipation about ‘what lies ahead.’ As you travel on, you will begin to catch glimpses of the next landscape, framed by the woods alongside the road. This landscaping technique was pioneered by Frederick Law Olmsted in Central Park, and was passed on to his associates and sons, who designed Caumsett’s ground for Marshall Field III. This effect is used throughout the estate, especially on the approach to the mansion Main House. If you have the good fortune of being here in spring you will be treated to the annual daffodil show. Field’s first wife, Evelyn, instructed Mr. Gillies to plant daffodils to cover soil left bare by construction. Gillies complied, planting some 250,000 bulbs around the estate, including a large grouping here. The remaining daffodils are descendants of those planted here in 1926. 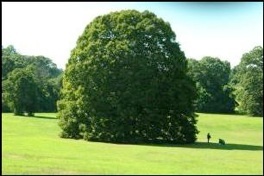 As you pass the speed limit sign (above photo right), take a look at the big round tree on your left. The centerpiece of this field, and one of the most popular destinations in the Park, is the gigantic American Beech (Fagus grandifolia). Although there are no records of its planting, this tree was almost certainly placed here for its beauty. 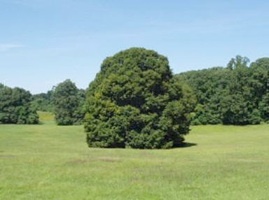 The tree shows the magnificent form trees can take when free of close competition with other trees. Note its full, round shape and low-hanging limbs. In a forest setting, trees often shed their lower branches because they can not receive enough light. A close inspection of the tree reveals three considerable trunks growing close together. Whether this is a single tree with three trunks growing from common roots, or if it is three individual trees growing closely together is unclear. Unfortunately, over the years, this specimen has been damaged and defaced. Please refrain from climbing or cutting into the tree. The other trees in the field, though large in their own right, are dwarfed by the Beech. They include a White oak (Quercus alba) and Black Oak (Quercus velutina). From a distance, you can distinguish between them from their foliage: black oak leaves are a darker green than the white oak, and from the bark. White oak bark is lighter gray and shaggy looking. Although the oaks and the beech look very different, they are part of the same family of plants. One of the characteristics they share is that the dead leaves usually remain on the branches throughout the winter. Continue to follow the paved road. If you look to the left during winter, you may see the water towers. 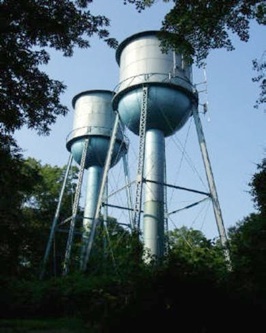 The water towers held a combined capacity of 175,000 gallons of water. Groundwater was pumped up into the towers from a well located ½ mile away; gravity did the work of supplying the estate’s water needs. The water towers were decommissioned in 2001 when public water was made available to the park. One of Marshall Field III’s passions was hunting, and Caumsett served as something of his private hunting club. 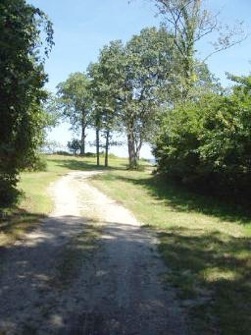 The dirt road on the right, leads to the location of the gamekeeper’s cottage and dog kennels. The road on the left side leads to the site of the pheasant pens. The estate’s gamekeeper, Douglas Marshall, was responsible for raising pheasants and training Field’s hunting dogs. Marshall bred and housed about 5,000 Ring-necked pheasants in the pens, whose ruins are still visible along the dirt road to the left of the main drive. Further down that road are the water towers and the maze-like hunting area., where the pheasant hunts were held each fall. On the morning of the hunt several hundred pheasants were released into the woods. Men, called beaters, and dogs flushed the pheasants out of the woods towards clearings where Field and his friends were stationed with their guns. At the end of the day, the hunters returned to the mansion Main House for a pheasant dinner. Although hundreds of pheasants were shot during the hunts, many managed to escape the hunter’s guns. 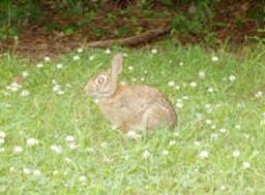 Their descendants can occasionally still be seen roaming in the woods and fields of the Park. All that remains of the buildings in this area are some foundations and fence posts. Two long clearings mark the location of the outdoor part of the pheasant pens. The ruins are interesting to look at, but all of the buildings - the kennels, the gamekeeper’s cottage, and the pheasant pens - are gone. Remnants, including foundations and some fencing, are all that remain, although they are largely overgrown by the forest. 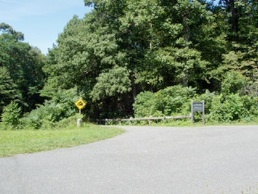 This stretch of road allows us a glimpse of something rare for Long Island in the 21st Century: large stretches of relatively undisturbed forest. The forest area on the left (west) side of the road has been allowed to grow on its own for more than 100 years. While there was much clearing of the land for buildings, pastures, and roads, a great deal of the property’s forested areas were left alone. These mature woodlands are important havens for the Park’s diverse wildlife. Looking into the forest you can see the ‘layered’ look that is typical of the deciduous forest. The branches of the tallest trees meet to form a ‘canopy’ that casts everything below in dense shade. Below this is an ‘understory’ (or sub canopy), consisting of smaller trees. The understory includes trees that will eventually grow up into the canopy as well as small trees, like the Flowering dogwood (Cornus florida), that reach a maximum height of 20 feet or so. The ‘shrub’ layer, composed mostly of bushes that are about the height of a person, is obvious in this stretch of woods, and is dominated here by Maple leafed viburnum (Viburnum acerifolium). Finally, there is the ‘ground’ layer, home to wildflowers, and the place where everything in the forest ends up. Not comfortable with woods coming too close to the road, the planners and estate managers cut back the forest along either side of the road, leaving a few trees along the way. A strip of mowed areas can be seen on either side of the drive. A number of trees were left standing, and others were allowed to grow, in order to keep the road shaded. These mowed strips are excellent places for observing wildflowers throughout the year. You may see pink wild geraniums and many violets in the spring; and asters in late summer and fall. This path will take you down to the seashore at the now-demolished Master’s Bathhouse. It is approximately ½ mile to the seashore, and will likely add 40 minutes or so to your journey. 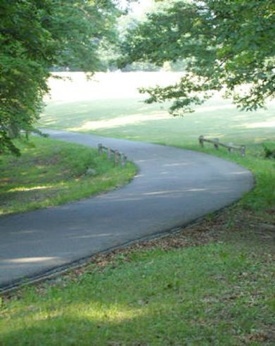 With the exception of this part of the road section, the road to the bathhouse is flat. This half mile walk leads to some of the most spectacular scenery in the park! While we will take you along the path, you should at least plan on seeing this side of the park. The gray-green coating on the rocks of the retaining wall on your right is lichens. Lichens are part plant, part fungus that illustrates the concept of mutualism - two associated organisms that benefit each other. In this case, the fungus provides important nutrients and minerals that are used by the plant (algae) to produce sugars, . 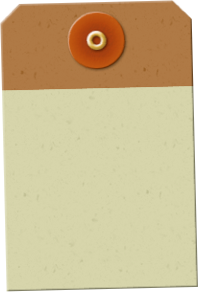 The sugars which are then shared with the fungus and provide it with nutrients. Lichens are also known as pioneer organisms because of their ability to grow on bare rock. They are an important part of soil formation and help improve soil conditions, which allow other types of plants to become established. The road cutting and retaining wall allows you to look at the forest floor up close, without having to get your knees dirty. The forest floor is the recycling center of the forest. Dead leaves, branches and limbs, animal wastes and remains - all this comes to rest on the floor of the forest. Invisible bacteria and microbes, fungi, and small invertebrates (i.e., animals without backbones) begin to decompose these items, releasing valuable nutrients back into the soil. This recycling process enables the soil to sustain the forest. The steep slope on this hillside is carpeted with different mosses. Mosses are simple plants that need cool, moist environments to grow in. During the right season, they raise their small spore capsules into the air, like a miniature flagpole, and release millions of microscopic spores into the air. If the spores land in a suitable environment, the spores will germinate and form the next generation of moss. 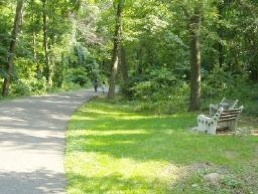 The dense woods along either side of this path are an example of a well-developed woodland. 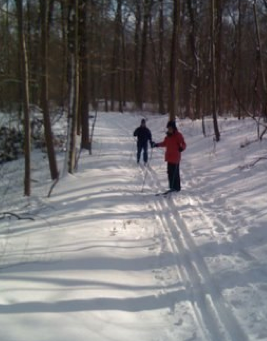 To the left, the woods are mainly a mix of oak and hickory. On the right hand side, where the land is flatter and slightly damper owing to the proximity of the pond, wet ground trees and shrubs like Red maple, Pepperbush and Blackgum (Tupelo) begin to dominate. This stretch of woodlands is extremely rich in bird life, particularly during the spring and fall warbler migration. At location x is a large Paulownia tree (Paulownia tomentosa), also known as the Princess Tree. 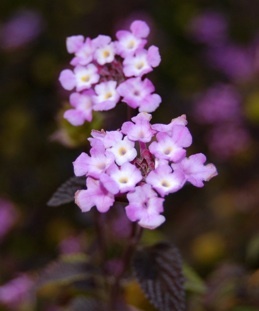 Native to Asia, a number of Paulownias were planted around the estate for their beauty. Each spring the tree bears spikes of light purple flowers that grace the canopy before most trees have fully leafed out. The dried seed pods remain on the tree until the following spring. The Paulownia tree is also notable for the thick growth of Poison ivy climbing up its trunk. The vine’s fibrous brown rootlets are used to cling to the tree’s trunk and enable the poison ivy to grow well up into the host tree. In winter the vines looks like a hairy rope. 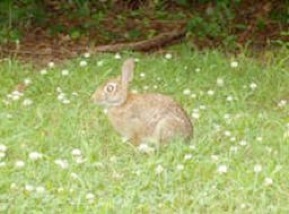 Master’s Bathhouse Area area is rich in historic as well as natural diversity. 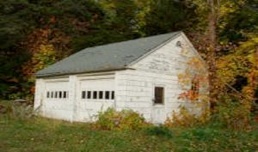 The Master’s Bathhouse was one of several recreation centers on the estate. Here you could enjoy a swim, either in Long Island Sound or in the in-ground swimming pool in front of the bathhouse. 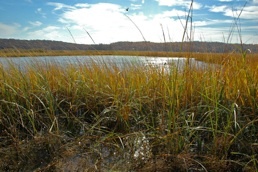 This area also has a number of interesting natural features, including the seashore and a vernal pond. 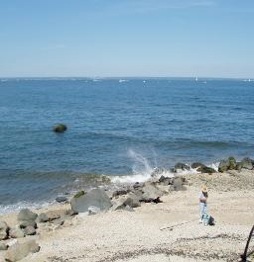 - a place for swimming (in either Long Island Sound or a saltwater swimming pool) or tennis. The sections that follow deal with each of these areas in some detail. 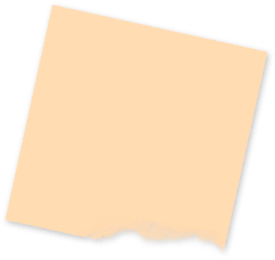 The following sections deal with each of these areas in some detail. The Master’s Bathhouse was a small, shingled building that stood at the top of the rise overlooking Long Island Sound. It featured men’s and lady’s changing rooms and showers, a functioning kitchen, and a lounge with a fireplace. In front of the bathhouse was an in-ground saltwater pool filled with filtered saltwater. To protect the bathhouse, a stone jetty was constructed on the beach to minimize erosion and the bluff was shored up with fill and rubble. The foundation of the building is once again clearly visible from the beach. 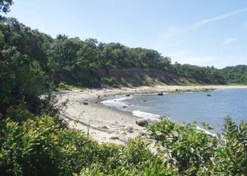 The rocky north shore of Long Island was formed from the deposits of two separate glaciers, and the subsequent erosion of those deposits over thousands of years. Most of the randomly scattered boulders along the beach (especially further to the west) simply fell to the beach as rain, wind, and gravity removed the surrounding soil. Here at the bathhouse, however, the rocks piled out in the water were deliberately placed to minimize beach erosion. A second jetty is visible to the right (east). The jetties trap moving sand, which is deposited in the area in between. During low tide, the sand bar becomes visible and was presumably the main bathing area for the Fields and their guests. 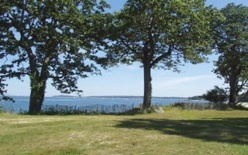 Beyond the eastern jetty (out of sight from the Master’s Bathhouse), Field had a row of changing rooms erected for the servants’ use of his employees. Scattered around the immense front lawn are several gigantic little leaf lindens (Tilia cordata). These lindens, the two red maples on the north side of the house, and several large trees near the Dairy, were transplanted to the estate from other locations on Long Island when they were fully grown. One tree measured 78 feet tall when moved! Another was so large that it had to be transported to the estate on a barge! These trees were probably a minimum of 50 years old when moved, which would make them more than 125 today. After two and one-half years of construction, the Fields moved into the main house in December of 1925. The building, designed by John Russell Pope, had 108 rooms, 13 fireplaces, and 3 massive, coal-fired furnaces. Twenty-two people were employed full-time at the house when it first opened, living in the large servants’ wing on the east end of the house. The interior of the house was richly furnished and decorated, with a heavy English and European influence. 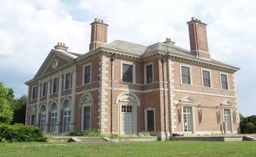 Despite the time and expense in building and maintaining the house and grounds, Caumsett was essentially a part-time residence for the Field family. In addition to Caumsett, the Fields maintained homes in New York City, Chicago, Maine and South Carolina (a plantation of 13,000 acres). 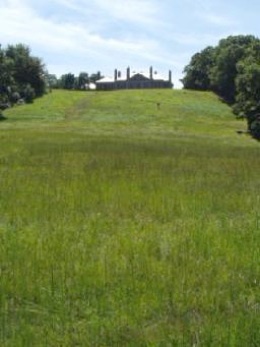 By 1950, the Fields’ needs had changed, and the costs of maintaining Caumsett were increasing. Ruth Field (Marshall’s third wife) and Marshall decided to have the house remodeled. Two sections of the house, one from each end, were removed, including the living room and master bedroom suite from the west wing, and servants’ quarters from the east wing. Large sections of the interior were remodeled to provide new kitchens, servants’ quarters, living room and library. The “Fresh Pond” dates back to the arrival of the earliest settlers of Lloyd Neck and is shown on a maps dated from 1685. When Field constructed Caumsett the existing pond was drained and dynamited, a series of drains and aerators was installed, and trout were stocked for sport fishing. The concrete structure in the woods to the right is a remnant of the circulation system. The pond today is home to a rich variety of aquatic life, including largemouth bass, Bluegill sunfish, frogs, Spring peepers and Bullfrogs, Eastern Painted turtles, turtles, and a large number of waterfowl. Take another look above...the pond is in the shape of a heart! There are two sections of the pond, separated by the low rock dam. The section in front of you here is only about two feet deep; however, the bottom is covered with a thick, gooey mud that is an additional two feet or so deep. The mud is the result of years of accumulating sediment from runoff and debris from the surrounding trees, and . The mud is home to an astounding variety of benthic (bottom dwelling) animals, notably such as immature dragonflies, damselflies, and beetles; leeches, snails, and aquatic worms. 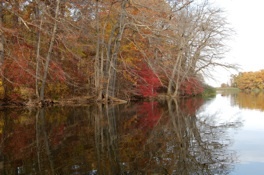 The shore on this side of the pond is lined with tupelo, or Black gum, trees (Nyssa sylvatica). The leaves of the tupelo are among the first to change color in autumn. In late September and early October, this side of the pond comes ablaze with the brilliant scarlet of its leaves. If you follow the gravel drive to the southern shore the pond you will see an amazing site. Beyond the dam, the pond opens up and becomes a very different type of pond. Here, the water is sunny, clear, and deep (up to 15 feet at its deepest). The bottom of the large part of the pond is mostly sandy, lacking the thick muddy layer of the smaller section. In summer the air above the pond is filled with many iridescent dragonflies. Geese, ducks and gulls seek safety near the center of the pond, and Barn, Tree, and Rough-winged swallows swoop back and forth above the water, catching flying insects. If you are quiet and move slowly, you can often surprise a large, Great Blue Heron or snow-white Great Egret hunting fish in the shallows. The grounds around the Main House mansion are still magnificent, and show many of the features that the estate was designed with. 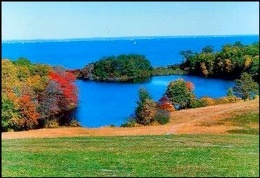 The North side of the house has a spectacular view down to the Fresh Pond and Long Island Sound. Although a naturally occurring hill, some 40,000 cubic yards of earth were moved around to create the view we have today. It is surely one of the best views on the Long Island. Face the rear of the mansion and walk to the right side. Take another right and enter the garden area. On the west side of the Main House are the Boxwood and Long Gardens. This area, like much of the grounds, was designed by the famed landscape architecture firm founded by Frederick Law Olmsted, the designer of Central Park, with substantial input from Evelyn Field, Marshall’s first wife. A walk through the Long Garden today offers just a hint of the former splendor of the garden. Several statues filled the niches in the brick wall that runs along the garden. In spring the apple trees in the garden bloom beautifully, and at the end of the Long Garden is the gate that leads to the never-completed terraced garden. During the next half mile, you will encounter two remaining mansion area buildings and the remnants of two additional buildings. The remaining buildings are the 10 car garage (now a remodeled into public bathrooms), built in 1925, and Dinham’s cottage, built in 1939. The lost buildings included an additional cottage, between the garage and Dinham’s cottage, which was used by Field’s head chauffeur and the indoor tennis courts. The chauffeur's residence was a cottage similar in style to the one next door. It occupied the flat meadow area next to Dinham’s cottage. The indoor tennis court building was on the right side of the road as you leave the mansion. 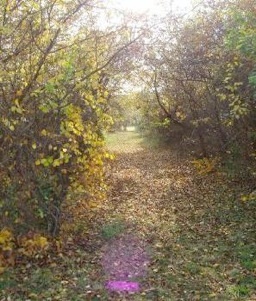 The driveway to the tennis courts, though rapidly overgrown, is still visible, as are portions of the buildings foundation. This building had, in addition to the lighted tennis court, an attached building with changing rooms for women and men, a kitchen, and an apartment. The heavy plantings of Rhododendron and Laurels in the woods here are not only pleasing on the eye, especially in early summer when in flower, but functional as well. The dense, evergreen shrubs are a visual barrier, shielding the drive and ‘pleasure areas’ of the grounds from the service areas on the east side of the house (You are now walking on the service drive). The outdoor tennis courts, now long gone, stood in the area to the right of the road. The surroundings of the courts were moderately landscaped, at Field’s direction. 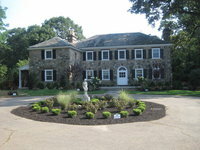 Some of the original plantings, mainly cedars, Japanese Yew (Taxus), Forsythia, and Rugose rose, remain visible. A few fence posts are also visible through the thicket. Over the years, the courts have become overgrown with vines, including bittersweet and poison ivy, and small trees and shrubs. The vines and dense thickets provide fine nesting areas for Gray catbirds; listen for their mewling, cat-like calls throughout the summer. Prior to colonization, the forest in this area were mostly undisturbed. The Native Americans in the area undoubtedly cleared land for settlements, hunted, and probably burned some of the forest but, because of their small numbers, the impacts were most likely small. With the arrival of European settles, however, that changed. More demands were made on the forest as the population grew, and the need for homes agricultural land, firewood and lumber increased. One of the unexpected side effects of human activity which is of great concern to scientists today, is the impact of invasive vegetation, which can be seen along this next mile of road. Invasive species are aggressive plants or animals that push out native (that is, those that occur here naturally) species. 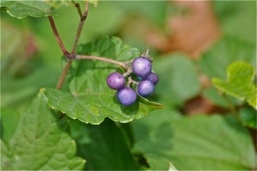 The invaders here, mostly wild grape and Oriental bittersweet vines, grow rapidly up into the surrounding trees and shrubs. Their leaves hang over the branches of the host plant, and actually ‘steal’ the sunlight needed for growth. This can and often leads to the death of the host plant, and also prevents new trees and shrubs from growing in. Not only can they kill host plants, the invasive grow so quickly and in such numbers that they can prevent other things from growing. The lack of diversity in plant life can lead to a lack of diversity in animal life. 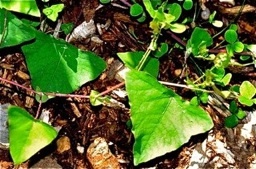 The invasive plants become established in areas that have been disturbed, either from human activity such as road and home building, or from natural tree falls. The vines often take on unusual and grotesque shapes as they crawl over the surrounding plants. Vines are not all bad, however. The fruit of grape and bittersweet are food for a number of animals, especially birds, and the dense tangles provide cover and protection from predators. All in all, however, this type of growth can eat into a forest and lower the overall diversity of its flora and fauna. There are several side views into the meadows from the road. Note the differences between those meadows that are allowed to grow wild and those that are maintained as a close-cropped lawn. Park management allows many of the fields to grow wild. 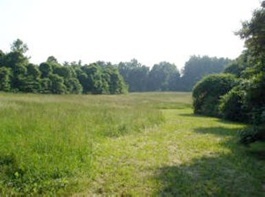 These meadows are mowed once or twice a year and develop a beautiful growth of tall grasses and wildflowers. Summer wildflowers in the meadows include Black-eyed Susan (Rudbeckia hirsuta). In the fall various species of Goldenrods (Solidago) dominate. These meadows are important havens for insects like spiders, and small mammals such as shrews and voles. Many birds, including Red-winged Black-birds, Sparrows and Meadowlarks, take advantage of the thick cover and abundant plant and animal food in the meadows. The grass is kept short for the benefit of horse and rider. In the winter large flocks of Canadian geese feed on the grass; in the spring they are joined by Killdeer. The small, white house ahead is currently the residence of Caumsett’s superintendent. During Marshall Field’s time, this house was home to several families that lived on the estate, including the head groom from the Polo stables. Looking at the above photograph from this particular vantage point gives you a good idea why many visitors to the Field estate thought this beautiful building was the main mansion! The stable scenes were filmed right here! 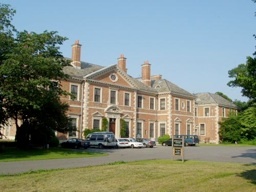 Like the Main House, the Polo Stables were designed by architect John Russell Pope in the same style. The building has stalls for 16 horses. The stables were ornamented with a matching pair of working fountains and a clock tower. 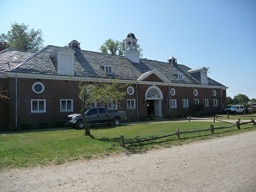 Apartments in the building were home to several staff who worked in the stables. Riding was a very important part of life at Caumsett. The Polo Stables and fields are not open to the general public. Although Marshall Field III treated his employees well, proper high society etiquette required most of the estate’s employees to remain separate and out of sight from the family and their guests, including on the roads. 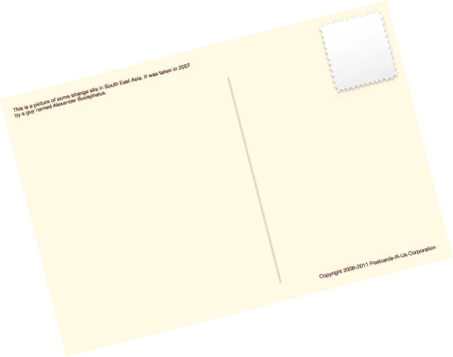 The road you have followed thus far, and which continues straight ahead, is the service drive, and was used by employees and deliverymen. To the right and left is the Main Drive, used by the Fields and their company. To the left it passes between the Winter and Summer Cottages and out the main estate gate. To the right it meanders up to the Main House. The tree immediately to the right is a Black Walnut (Juglans nigra). In September and October, one must be wary when standing next to this tree - it frequently drops its large, heavy walnuts to the ground! Once the thick, green husks are split open, the nuts inside are eagerly eaten (or buried) by the Park’s squirrels. 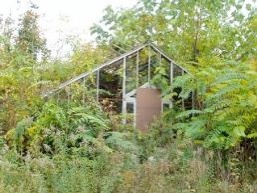 Further to the left, out in the field beyond the road, is an overgrown Boxwood garden that was part of the landscape of the Summer Cottage. On your visit to the Summer Cottage (straight ahead), be sure and walk through this garden. Imagine what it must have been like! The Summer Cottage was built in 1939 to provide extra space for guests. 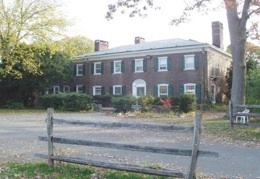 Ruth Field, Marshall’s third and last wife, moved to the Summer Cottage in 1961 after selling the bulk of the estate to the Long Island State Parks and Recreation Commission. 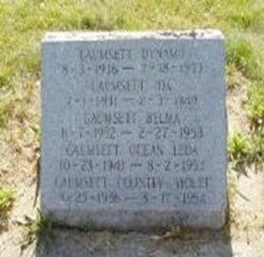 She moved out of Caumsett for good in 1966. The Summer Cottage is now used by Nassau BOCES as an environmental and outdoor education facility. Now that you have visited the summer house, let's visit the winter house... Walk in the direction of the pony stables. Notice the road on your left. The Winter Cottage, along with some of the servants’ quarters near the Farm group, was the first residence to be completed on the estate in 1923, and was used by the Fields until the completion of the Main House in 1925. The building, like most on the estate, was designed by the famed architect, John Russell Pope, who had designed the Jefferson Memorial in Washington, D.C. The Winter Cottage’s grounds were designed by Marian Coffin, a very well-regarded designer landscape architect of the day. The design for the building and grounds was very naturalistic - designed to blend in with the natural surroundings. The intricate plantings included 150 Rhododendrons, cedars, boxwoods, and hemlocks, and heather. 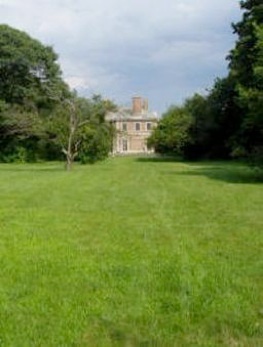 At the far end of the field to your left is the former site of the Clark House, home to John Spenser Clark. Clark was the estate manage for Marshall Field III. He also ran the Dairy Complex. The two-story house had a commanding view of the waters of Lloyd Harbor. Unfortunately the house was destroyed by fire, though portions of its foundations are still visible. From here you may also see the remains of the greenhouses’ foundations. Opposite the Dairy is the walled kitchen garden. Under the supervision of George Gillies, the Head Gardener, this 4-acre garden supplied fresh fruit, vegetables, herbs, and flowers for the Field’s dinner table, and fresh flowers to beautify the houses of the estate from the 1920’s to the 1950’s. A group of 10 greenhouses stood behind the garden and also kept the estate well-provided with flowers and fruit throughout the year. A cottage behind the garden was home to the estate’s head gardener and Mr. Gillies and his family. Louise Gillies, George’s wife, recalled the bean poles along the south wall of the garden and the honeydews, so beloved by Mr. Field, in the greenhouse. Some of the estate workers’ families remember the delicious cherries that grew in the area surrounding the Walled Garden. Flowers were cultivated to be shown in various horticultural shows in the New York-Metropolitan area. Many of the flowers were prized specimens or estate hybrid varieties. Notice the three statues, originally purchased by the Fields, which accent the beauty of the plantings. 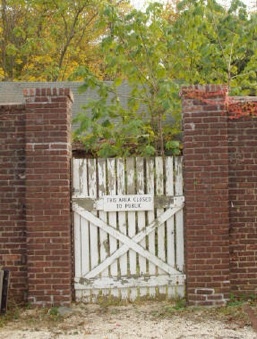 After many years of decay, the Walled Garden has been restored through a cooperative project between the Caumsett Foundation an the New York State Office of Parks, Recreation and Historic Preservation. 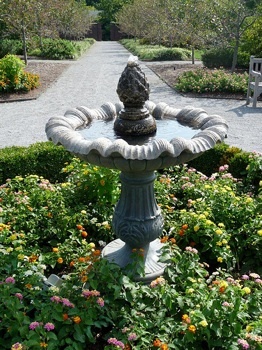 The fountain, with a boxwood centerpiece, attracts many birds that frequent the park. A cultural art series of programs is presented in the Walled Garden during the summer months. If you look south while in the walled garden, you will see the location of the greenhouses. A group of ten greenhouses kept the estate well-supplied provided flowers and fruit throughout the year. Please note that this section of the park is not opened to visitors due to safety reasons. The former Marshall Field house is now vacant. 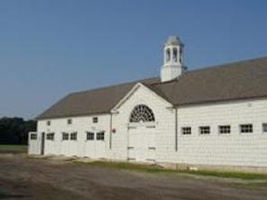 The polo pony barn now serves as part of the Lloyd Harbor Equestrian Center. The summer cottage houses the Nassau BOCES Outdoor and Environmental Education Program. The historic 1711 House Barn is leased to the Lloyd Harbor Historical Society. As you return to the parking area, remember that there is far more to see and do here - there’s the salt marsh, more beaches with magnificent views, fields and forests to explore; a saltwater fishing area, bike riding, and education programs. For more information on programs, permits for fishing or upcoming events, stop at the information kiosk or ask the attendant at the parking area. We hope that you’ve enjoyed your guided walk through the Park and that you’ll come back again and again!